The Parallel Bed is a fabric or leather upholstered bed frame with a playfully shaped trapezoidal headboard. Designed by Jeffrey Bernett in 2013, the Parallel Bed is constructed with a sturdy oak or walnut frame and is paired with a large range of upholstery materials and color options that add character to any bedroom. The Parallel Bed (Queen Size) has a length of 88 3/4” | 225 cm, headboard width of 77 3/4” | 197 cm, headboard height of 35” | 89 cm, footboard width of 68” | 173 cm, and platform height of 13” | 33 cm. The top mattress surface of the Parallel Bed has a typical height of 23” | 58 cm from the floor if a 10” | 25 cm modern mattress is used. 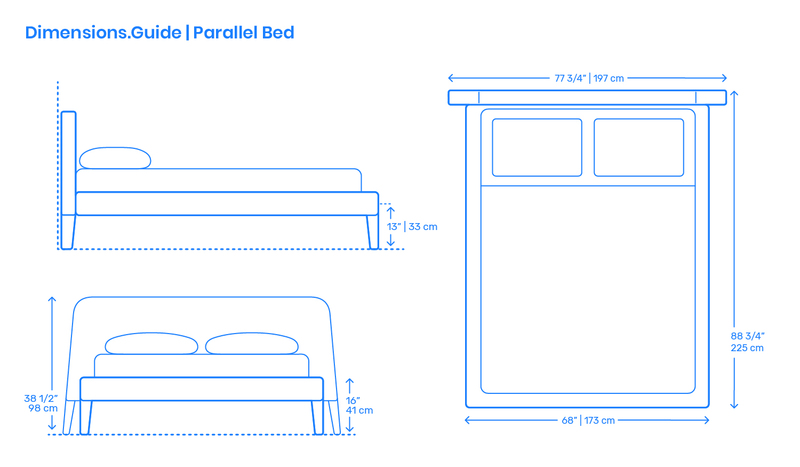 What is the Parallel Bed? The Parallel Bed is an upholstered bed frame with a playfully shaped trapezoidal headboard designed by Jeffrey Bernett in 2013. How big is the Parallel Bed? The Parallel Bed (Queen Size) has an overall length of 88 3/4” | 225 cm, headboard width of 77 3/4” | 197 cm, and platform height of 13” | 33 cm. How high is the bed surface on the Parallel Bed? The overall bed height of the mattress on the Parallel Bed is 23” | 58 cm from the floor if a typical 10” | 25 cm modern mattress thickness is used.